The Bespoke Report — The Resistance! The S&P 500 finished the week with a slight gain after posting positive returns early in the week and declines late in the week. Friday saw declines early in the day, but investors really stepped up their buying in the afternoon to fully erase what had been a pretty sizable decline. Friday’s late-day strength was a microcosm of the intraday buying trend we’ve seen all year. 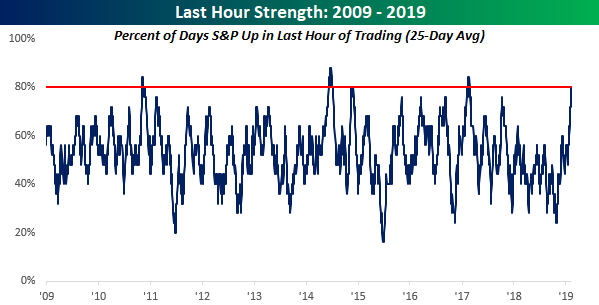 As shown in the chart below, the S&P 500 has rallied in the last hour of trading on 80% of trading days over the last five weeks going back to the start of 2019. Readings of 80% or higher have been rare over the last 10 years dating back to the start of the bull market in 2009. We analyze the importance of late-day strength in this week’s Bespoke Report newsletter. We also cover a number of other technical, fundamental, and sentiment measures in this week’s report. To read the Bespoke Report and also gain access to our full suite of investor tools, start a two-week free trial to one of our three membership levels. You won’t be disappointed!